Painting Charcoal on Paperboard | 30" x 22"
Painting Charcoal on Paperboard | 30" x 10"
Painting Charcoal on Paperboard | 10" x 30"
Painting Acrylic on Canvas | 18" x 14"
Mixed Media Mixed Media on Canvas | 18" x 59"
Painting Acrylic and Oil on 100% Acid Free Reg Paper | 42" x 28"
Inspiration comes in many forms; I am inspired by virtually anything that has the power to catch my attention. I paint several subjects - buildings, people, animals, history and abstract art. I paint these not because I want to cover a range of subjects, I paint because these have had an impact on me, they have caused me to look closer and see things that I would not have otherwise; they stir deep emotions that tug at the strings of my heart which are equally matched through my paint brush. My paintings capture the reality of this world and combine it with the beauty that only true detailing can bring to a work of art. 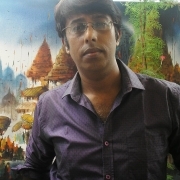 Ananda Das is a B.Com graduate from Kolkata and is one of India’s finest painters. His talent can be seen through the variety of subjects he paints, ranging from inanimate architecture to lively humans and animals. He has exhibited his art work in many solo and group shows in Mumbai, Kolkata, Gujarat and Delhi. He has also participated in several art camps across the country.